Announcements / Play at The Sandbox Evolution - Build. Play. Share - Now Available Worldwide! Announcements / The Sandbox Evolution (The Sandbox 2) - Official Launch Date Announcement! Announcements / The Sandbox - Update 1.99996: Halloween! The new 1.99996 update HALLOWEEN is out on iOS! Play with the creatures of the night: Headless Horseman, Vampires, Werewolves and more! What's New in the Update 1.99996? ▪ 1 new controllable element, the Headless Horseman, a ghastly rider on a demon steed that can throw his pumpkin head as a projectile that explodes. The Vampire will seek and attack Humans, and occasionally move around by shapeshifting into a Bat. They cannot do this when under the effect of light. The Werewolf will also seek and attack Humans, and will go back to Human Form after a while. However, it will turn back into a Werewolf unless affected by light. Jack O’ Lantern, Cauldron, Haunted Tree and Tombstones. Announcements / The Sandbox - Update 1.99994: Underwater! The new 1.99994 update "UNDERWATER" is out on iOS! What's New in the Update 1.99994? ▪ Atlantean, a humanoid with fishlike features that can breathe underwater and suffocates when outside of it. He can also dash forward when swimming, and jumps instead when he’s not. Has a ranged attack. ▪ Submarine, a vehicle that can only move in water and can shoot Torpedoes to defeat its enemies or obstacles. Torpedoes are projectiles that can move in liquids and do not destroy them when they explode. ▪ Shark, a fearsome predator of the sea, moves from one side to the other in search for prey. ▪ Jellyfish look cute and glow in many colors but are extremely poisonous and should never be approached. ▪ Torpedo Launcher, which is activated and used the same way the Rocket Launcher is. Torpedoes are rockets that only move in Water. If they are spawned elsewhere, they will simply fall downwards and explode when touching the floor. ▪ A campaign of 18 levels where you will follow Jones in his search for the Lost City of Atlantis. He will, however, spend most of the adventure in the Submarine, and will find an unexpected friend on the way: the Atlantean Prince. Fight your way through underwater caves, mysterious temples, and even the mouth of a giant beast. Announcements / The Sandbox - Update 1.99987: Mutant Monsters! The new 1.99987 update "MUTANT MONSTERS!" is out on iOS! Ever wanted to put Giant Monsters against each other in a world you made yourself? Discover the power of the MutaGem, and experiment with it on living elements! You can even use the Mind Ray to control them and fight yourself! What's New in the Update 1.99987? - A new element, the MutaGem, that has the power to transform living beings into monsters. - A campaign of 18 levels will begin when you discover the MutaGem, deep inside the devastated nuclear wasteland you find at the end of the Ecology 2 campaign. This adventure will transport you through many different places, as you learn to release the power of the MutaGem's capabilities, the Giant Monsters it can create, and take control of them with the help of the Mind Ray. - The Aberrations: failed products of the MutaGem that hate the world and will try to crush anything that moves. - 1 New Animal, the Earthworm. Usually found in soil or mud, ocasionally goes to the surface out of curiosity. He's the Catalyst for the DoomGrub Element. - 1 New Enemy, the CrocoBot. Behaves just like the Crocodile, but thanks to its enhanced durability and mechanical upgrades any target within range will be no match for the missiles it shoots from its mouth. - Haijira, the likable and gigantic grey Dinosaur, that strikes with its tail and lets off a deadly blue Energy Breath. - MechaRex, the mechanical counterpart of Haijira, a Cyborg T-Rex that strikes with its mouth and fires a scorching red Laser Breath. - The Mind Ray, a weapon that will allow you to take control of the Giant Monsters and fight the world (including other monsters!). Announcements / The Sandbox - Update 1.9998: Relic Hunting Time! The new 1.9998 update "RELIC HUNTING TIME!" is out on iOS! Ready for a new exploration and action campaign? Control Jones, the new adventurer character, explore ancient temples, brave all the danger of the Mayan Jungle and discover new treasures! Discover Jones, Arnold's new fellow and his goods : Whip, Rope, Boomerang and Torch! Fight Snakes, Mayan Guardians, Piranhas and Killer Bees in order to reveal ancient secrets buried in a strange temple, deep down a dangerous jungle. ▪ 1 new platform-oriented campaign of 16 levels, featuring Arnold and Jones. Contests are back in a new shape! You now have two weeks to post your entry and the winner will earn a place in our top games! To participate use kamcord to record your creation with the # "Spaceship" or mail us a caption of your creation BEFORE sharing it in the online gallery. Announcements / The Sandbox - Update 1.9996: Superheroes have landed! To participate use kamcord to record your creation with the # "Celebration" or mail us a caption of your creation BEFORE sharing it in the online gallery. Contests / (Contest) Create a New Year Celebration! Announcements / The Sandbox - Update 1.9995: Brainiac is back! The new 1.9995 update "Brainiac is back" is out on iOS! Play at the Brainiac Vol.3 Campaign: 15 levels combining Brainiac, Contraptions, Controllable Elements, Pixel Art and Music ! Create more games with 4 superheroes from Invincible comics. They have awesome powers : duplication, pyrokinesis, transmutation and invincibilty! Ready? Action! + Brainiac is back in a whole new campaign of 15 levels. Now it wants to redeem in front of the humans. Help him to be good again and save people from a world cathastrophy. + New Bodies to assemble with the Brainiac for making incredible contraptions: Santa`s Sled, Dragon, Kaiju, Mecha, Turtle Drone and a Bomber plane! - new built-in help system with FAQ, Videos and more! Like every week, we organise a contest! Craft a Native American Totem, with contraptions and magic! Winner will be chosen by the community amongst 4 finalists. Share in this thread a capture of your world or a video on kamcord.com with the #, #totem contest to be a part of them! Deadline is on December 3rd at midnight! Craft a royal castle, with contraptions and wealth! Winner will be chosen by the community amongst 4 finalists. Share in this thread a capture of your world or a video on kamcord.com with the #, #castlecontest to be a part of them! Deadline is on November 26th at midnight! Announcements / Topic: The Sandbox - Update 1.9990 for iOS now available! The new update is here ! The new 1.9990 update "Action Update" is out on iOS! Arnold is back! 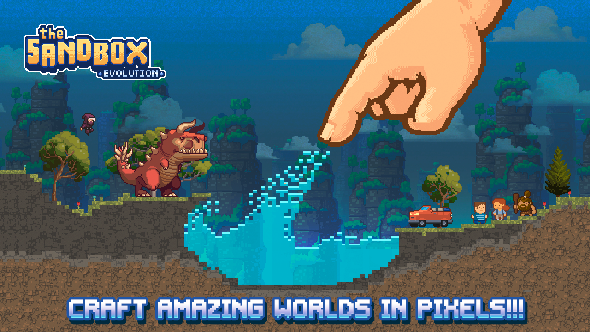 Fight your way to make our controllable action pixel character survive through 2 intense campaigns of 18 levels in total. Good luck! Check the 13 new elements to make your own action game. Add new enemies such as a Mummy, a Grunt Soldier, a Slime or a Predator. Place traps and many other dangers for our hero to escape! + 2 new action-oriented campaigns of 18 levels, featuring Arnold, our new controllable character who can jump, shoot and place bombs! Try to survive all the dangers and make your way to the survival! - New Enemies: Mummy, Grunt, Slime and a Predator creature who will endanger Arnold, kill them all! - Power Ups: Ammo, Bombs, Armor, Health and Bazooka! Contests / (contest) Craft a Medieval Castle! Deadline is on November 14th at midnight!